To make the crepe batter, eggs, milk, flour, cocoa powder and sugar are mixed in a blender, strained into a bowl and chilled. The crepe pan is heated, buttered and about ¼ cup of batter swirled around to cover the bottom of the pan. 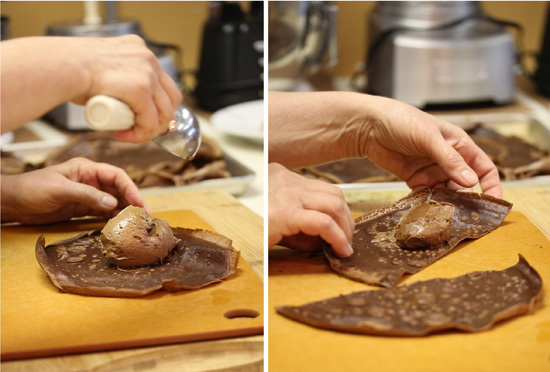 Grace-Marie used an ice cream scoop to portion out the chocolate mouse into the crepes. You can use a full-sized crepe and roll it up, or cut one in half and form each half into a cone for a dramatic presentation. Below you can see the Chocolate Mousse Crepes and the Chocolate Pavlovas with Strawberry Balsamic Compote on the plate as they were served to the friends who came to class. These were some very happy people, including me. Yum! 1. Combine eggs, milk, flour, cocoa powder, sugar and salt in a blender. Process on low speed until blended well. Strain and transfer to a bowl. Cover and chill for at least 20 minutes. 2. Heat 8-inch non-stick skillet or crepe pan with a tiny drizzle of butter to coat bottom well. 3. 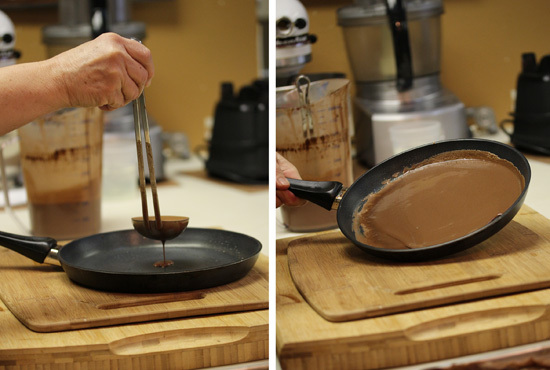 Pour about ¼ cup crepe batter into pan and quickly swirl it to coat bottom of pan. Cook just until top surface of crepe begins to look dry (a minute) then flip (or using your fingers turn it over) and cook the underside for 30 seconds. 4. Transfer to a platter to cool. Repeat with remaining batter. 1. Whip 1 cup whipping cream to stiff peaks and chill, covered. 2. Heat 1 ½ cups heavy cream nearly to a boil. 3. Combine chocolate chips, espresso powder, vanilla, salt and hot cream in a blender. 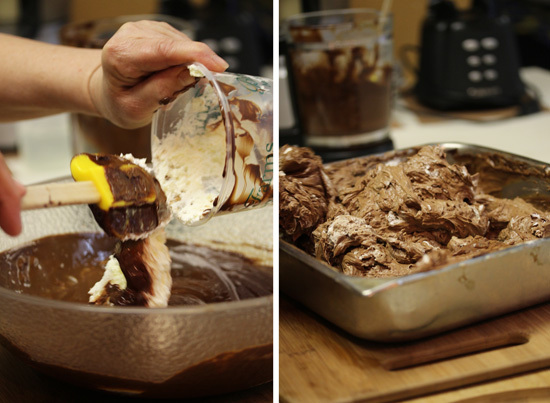 Pulse a few times to mix ingredients, and then blend until chocolate has melted and mixture is smooth. 4. While mixture is still warm, add egg yolks and process again to mix in well. Transfer to a bowl and cool completely to room temperature. 5. Once cool, fold in whipped cream, cover and refrigerate until well chilled. 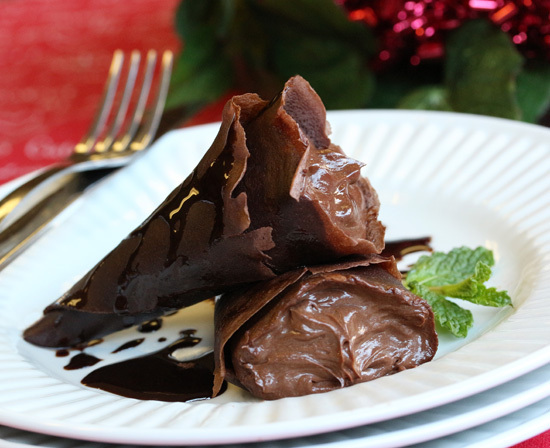 Fill each crepe with a portion of the mousse, plate 1-2 per person. Drizzle with your selected sauce(s), then dust with powdered sugar or cocoa – or be creative with any combination of garnish! 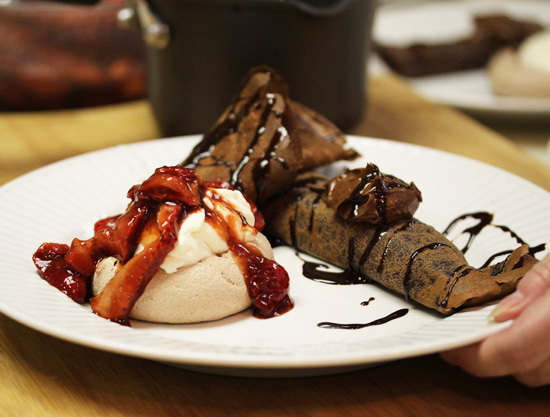 For a serving variation, cut each crepe in half and create “half moons”, fill with mousse and fold points of each crepe over to create a cone – plate, garnish and serve. Oh my… I am speechless. Beauty on a plate! and your photos make you want to eat them off the screen! Thanks for sharing this Lynne. I happened upon this site by accident. I just wanted to say what a wonderful and well assembled site. This will definitely be a favorite. 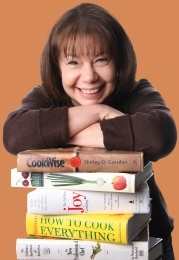 Thank you for sharing your most treasured recipes. I will certainly put them to work. I too love to cook, bake and breathe food. My day job keeps me busy but find time to try knew things as often as possible. Luckily I raised my girls not to be picky eaters so they eat everything I put in front of them and are quite honest if a dish doesn’t make the cut. But those are far and few between. Keep those recipes coming. I will be making a bunch of these at least once since they all look so yummy! Thank you.